All of HACOOL products are hand-made&fine workmanship for you! Each pendant will be engraved carefully in a smooth edge and finally give you a exquisite jewelry. No more worry about what kind of outfits you wear,Wearing our customized necklace will get more attention for you. Be confident, your are the best one. Order one for someone special, or personalize one as a treat for yourself. In order to extend the life of this plated piece, remove jewelry when sleeping,exercising, or doing other physically strenuous activities, as prolonged contact with sweat will cause the plating to wear away faster. In addition, avoid contact with perfumes, water, body oils, and other chemicals, including household cleaners. Never use chemical jewelry cleaners as these will wear away at the plating and do more harm than good. We are highly recommend that you should wear solid gold or sterling silver jewelry if you are sensitive skin. And our hot-sale products are personalzied items, you can choose some items for yourself or someone special. 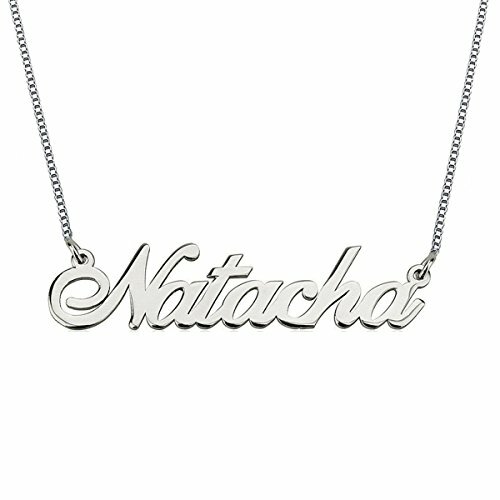 HACOOL letters will be engraved elaborately to give you a meaningful necklace with perfect details. a good way to treat yourself or a special gift for someone you love at Mother's day, Father's Day, birthday or anniversary. The product is made of brass and plated gold, will not deform easily. HACOOL passed the examination of Amazon's Fine Jewelry category. Every HACOOL product has passed SGS Quality Certification. If you have any questions about this product by HACOOL, contact us by completing and submitting the form below. If you are looking for a specif part number, please include it with your message.